Who creates the PE exam? What are the dates of the PE exam? Are reference materials allowed on the exam? When should I register for the PE exam? How much does it cost to take the PE exam? What is a good score for the PE exam? When should I start preparing for the PE exam? How much math do I need to start preparing for the PE exam? What are the acceptable calculator models allowed for the PE exam? The Principles and Practice of Engineering Exam is an eight-hour exam designed by the NCEES (National Council of Examiners for Engineering and Surveying) that must be passed in order to obtain an Engineer’s license. The test can vary for each engineering discipline. The official NCEES website provides greater overview of the test formats. The PE exam is created and regulated by the NCEES for all licensing boards. To find specific information to the licensing board within your area, refer to the National Council of Examiners for Engineering and Surveying’s website. Depending on the discipline, PE exams are scheduled on one or both months. The PE exam is an open-book exam. You are allowed to bring reference materials to the exam, provided they are bound and remain bound during the exam. Loose paper may be bound with ring binders, brads, plastic snap binders, spiral-bound notebooks, and screw posts—but not with staples. Sticky notes and flags are permitted only when they remain attached to book pages. Contact your state’s licensing board for details about exam registration. How much does it cost to take the PE? Fees and exam schedules can vary by state. Contact your local licensing board for further information. The PE exam is based on a pass/fail basis. If you do not pass the exam, you will receive a diagnostic report indicating your areas of strength and weakness. The diagnostic report can assist you if you decide to retake the exam. You will be contacted by your licensing board within eight to ten weeks of the test date. Depending on your state, you will be notified of your exam result through your My NCEES online account or via mail from your state licensing board. The PE is scored on a pass/fail basis. Below are the pass rates for the April 2014 exam, unless otherwise noted. The pass rates for the October 2014 exam have not been posted yet. When should I start preparing for the PE? 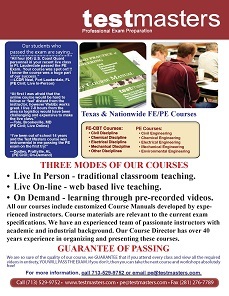 You are not eligible to take the PE until you pass the Fundamentals (FE) exam. Students usually have at least four years of experience in their discipline before taking the PE. Most licensing boards require that your work experience be under a licensed professional engineer’s supervision. To protect the integrity of the PE exam, NCEES limits the types of calculators you may use on the exam. The only calculator models acceptable for use during the 2014 exams are as follows.